Yeah, I know, I know. I make a lot of chilli. 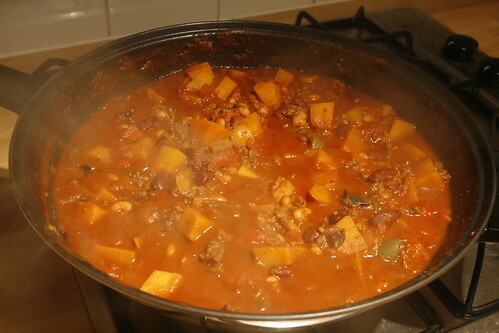 There’s this basic chilli recipe that I used in Chilli Skins, a Squash and Kidney Bean Chilli, a vegetarian chilli and most recently my sweet potato chilli. What can I say? I really like chilli. This recipe is subtitled “The Feed-Everyone Chilli” because it really is enormous. Garry and/or I ate a portion at least once a day for three or four days and it still wasn’t gone. Serve it with salad or baby spinach or rice and you’re sorted for ages. It’s also the first part of my Chilli-Wedges recipe, which was recently voted for on my Facebook Page as being the recipe you guys wanted to see most. The second bit is coming on Thursday. Start by spending five or ten minutes preparing everything. It’ll make life easier. The peppers need to be deseeded and diced. Dice the onion, tomatoes and the garlic clove. Peel, deseed and dice the butternut squash (Tip: If you haven’t got a good vegetable peeler, cut the squash into slices widthways and then chop the skin off that way). Brown the mince and remove it from the pan. Then fry the onions and garlic for five minutes. 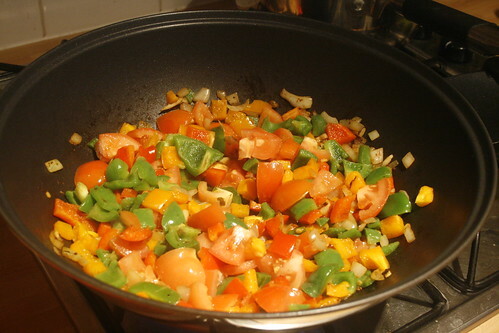 Tip in all the peppers and fry everything for five minutes. 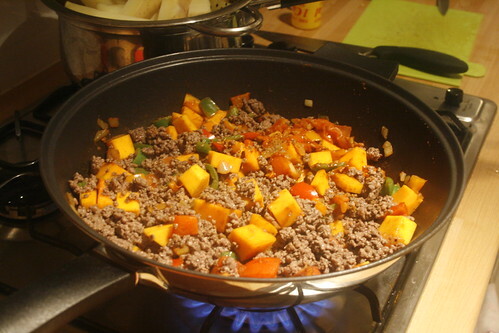 Add the tomatoes (the ones you diced, not the can) and the squash. Sprinkle in the spices and give everything a stir so it’s nice and coated. At this point add the mince back to the pan. Tip in the cans of tomatoes and the can of baked beans. Drain the kidney/butter beans and add them, too. Fill the can of tomatoes with water, slosh it round so it picks up all the juices from the side and tip that over the top. Stir to combine, and taste. Add salt and pepper if it needs be. Bring to a boil before leaving to simmer for 20-40 minutes — you want it to still be fairly liquid but the squash needs to be tender. Serve this chilli with either rice and salad or as part of chilli wedges (coming soon). butternut squash chilli is in the vegetarian recipes ??????? Thankyou I will try it.